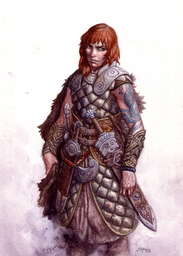 Shylent was assigned to the guard/militia at Tennyson’s Tower as a scout and warrior. She is currently assisting a special group from the tower investigating ogres and blood magic. Protection When a creature you can see attacks a target other than you that is within 5 feet of you, you can use your reaction to impose disadvantage on the attack roll. You must be wielding a shield.